New navigation channel to bring improvements to harbour safety. The dredging works to construct the Eastern Channel were commenced in January 2019 by CHC’s contractor Jenkins Marine, and the project completed on time and as planned, before the close of the MMO (Marine Management Organisation) consented window that runs to the end of March. The dredging could only be done over the winter due to the presence of eel grass beds off East Cowes. 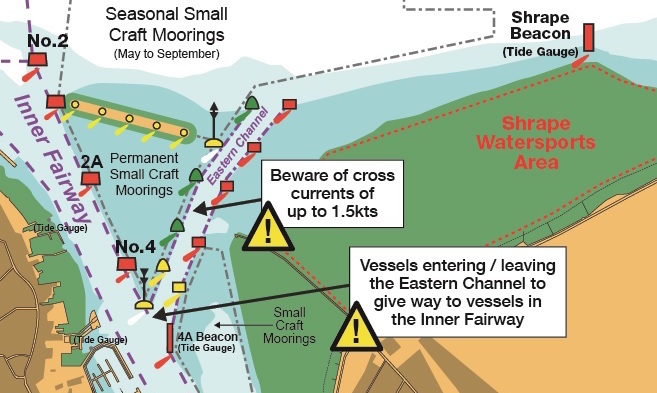 Small craft, up to 20m in length, approaching from or departing to the north or east can now use the Cowes Harbour Eastern Channel and avoid the busy main harbour entrance, thereby de-conflicting small craft from the larger commercial vessels. The 35 metre wide Eastern Channel is dredged to 2.25 metres below chart datum, therefore the minimum depth of water in the Channel is equal to the height of tide plus 2.25 metres. Small craft leaving the Eastern Channel when proceeding into the Inner Fairway should give way to vessels in the Inner Fairway and converge with caution as this area, with the East Cowes Red Funnel Ferry Terminal to the south, may become extremely busy, particularly during the summer months. All mariners are advised to see Cowes Local Notice to Mariners No. 10 of 2019 - Dredged Eastern Channel, for full details, including buoyage, navigation light characteristics, and safety information.